Facts about Peppered Cory "Scientific name for Peppered Cory fish is Corydoras paleatus". The Peppered Cory fish is a member of the order Siluriformes and Callichthyidae family. It is referred by various names including Corydoras paleatus, mottled corydoras, blue leopard corydoras and peppered catfish. It is native to the lower basin of Parana River and coastal rivers in Brazil and Uruguay. 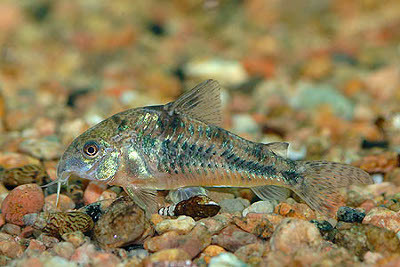 The Peppered Cory fish was one of the first tank-bred cory catfish. The Peppered Cory fish measures about 2 5/16 inches (5.9 cm) when it attains maturity. The males are clearly distinct from the females. The Peppered Cory fish have a much smaller bodies with pectoral and dorsal fins that are longer than that of the females. The Peppered Cory fish is commonly found around the Amazon basin. It feeds on crustaceans, insects, worms and plant matter. The Peppered Cory fish produce sound through abduction of their pectoral fins. This is a behavioral trait used by the males to attract the females during courtship. Also, the juveniles produce this sound whenever they are under stress. The Peppered Cory fish species does well in temperatures ranging from 68 to 75 F° (20 to 24 degrees Celsius). They adapt well meaning they can survive even in lower temperatures. Even though the Peppered Cory fish are not a specialized species that eats algae, they can be seen nibbling on the algae plants from time to time. The Peppered Cory fish species loves hiding in bogwood and does not enjoy very bright light. Test the water when preparing your tank for your fish: You will need to purchase a liquid tester so that you can test for Nitrates and Ammonia. The strip-style test kits are unreliable and a waste of money. You should use a dechlorinating product to remove the harmful chlorine from the water. Test for nitrite, ammonia, and proper PH 6.0 to 8.0. The ammonia should always be 0, the nitrite should be 0, and the nitrate should preferably be below 20 ppm. If it's at or above 40 parts per million (ppm), you have too many fish or are not changing the water often enough. Cycling your tank is important, Follow the steps to cycle your tank. This establishes healthy bacterial and chemical levels. The diet of the Peppered Cory fish consists of algae wafers, sinking pellets, live food such as daphnia and bloodworms. They also enjoy eating blanched spinach which is usually attached to the aquatic plants with small pegs. The Peppered Cory fish also take in atmospheric oxygen as a supplement to the oxygen that their gills manage to extract from the waters.